In the old days you had to travel around the world to Gypsy Jazz Festivals to get a chance to see the great masters play. Today it’s all on Youtube, one click away. Youtube is a really great platform for guitar players, but the best way to learn Djangos style is still to participate in as many Gypsy Jazz-jam sessions as possible. Here you will experience the energy in the music and hopefully find inspiration and get the music under your skin. 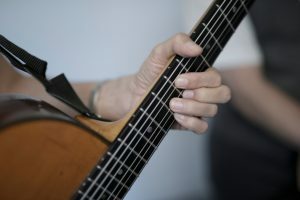 If you don’t get inspired by seeing great musicians play in real life, you may soon loose interest in this difficult guitar style – because it takes a long time to become a good player. You can find Gypsy Jazz-jam sessions in most of the big city’s all over the world or the many Gypsy Jazz Festivals. Check out some of the best Gypsy Jazz online guitarschools like Robins Gypsyjazzsecrets. Robin is dedicated to the Gypsy Jazz style and to the “gypsyjazz school”. He is a pioneer in teaching this style and his vidoes and books has been used in many years. At the homepage Rosenberg Academy you can also get video lessons in the “Dutch Style” by Stocholo Rosenberg. A lot of these videos are also on Youtube and it’s possible to slow the video down to 50% or 25% in speed, without losing the key – a great thing if it is going too fast. If you are more into the modern “French style” you can visit Dennis Changs Music School. He’s made a lot of videos and transcriptions of some of the great players like Bireli Lagrene and Selmer #607. He also feature some of the great rhythm-guitarplayers. Get hold of the “Django Fakebook” as PDF on the internet. Here you will find the basic melodies and standards that are most commonly used in Gypsy Jazz jam-sessions. In contains around 200 tunes and many of them are Django’s most famous melodies. Remember to sing the melody when you are rehearsing the chords, so you don’t get lost when you are practicing or playing. Learn a variety of the different Gypsy Jazz rhythms like swing, waltz, gypsy bossa, bolero and practice with a metronome if needed. It’s a good idea to record your own rhythm tracks – then you can use them later for practicing your solo playing. Now you are ready for practicing scales and licks and speed training – because you play a lot of notes in Gypsy Jazz!! Remember to start slowly and increase only the speed when every tone is 100% clear. For inspiration take a look at Yaakov Hoter’s video on how to increase your practicing and technique at GypsyAndJazz.com. Have fun and see you to our concerts and the jam sessions!